I managed to make it till 4am, but I think George stayed up the entire night. His flight left earlier, so it made more sense. Since my flight left at 3:15pm, which is 3:15 EST it didn’t make much sense for me to not have a nap, so I slept till about 7. Once I was up I headed to the coffee shop to check my flight info, and make sure everything was go for takeoff. I wanted to buy one last souvenir, but the shop didn’t open until 11, so I went back to the guesthouse, showered, and check out. At 11 I took the subway to the shop, made my purchase, then headed back to the guesthouse to grab my bag and head to the airport. Airport bus was cheap, and I had about 2 hours to kill at the airport. Spent the majority of my Hong Kong dollars, which was quite lovely, then got on the plane. Middle row, middle seat, between two sniffling Chinese guys. Not much for conversation, but all in all not terrible seat mates. I think I was a little fidgety as I tried to sleep. I managed a couple of intermittent hours, which will hopefully allow me to survive the evening when I get to Toronto. Watched a couple of movies ( “Vantage Point”, “Definitely, Maybe”, and about 10 painful minutes of “27 Dresses” before I had to turn it off), and listened to some inflight music as well. Even read, surprise surprise. Touched down on time in YYZ, but had to wait about 1.5 hours to get my luggage, as there was lightning preventing people from going on the tarmac. Made it unscathed through customs, and out the gate, which kinda sorta brings this travelogue to an end. Another rainy day. After a coffee and some email, I meet George and we venture over to the History Museum. Apparently the best museum in Hong Kong, and for a place with such an interesting history, I figured it’d be a good respite from the rain. All in all, not a bad museum, and we managed to spend a good two hours or so, walking through – taking our time reading up on lots. George was looking to chill out at the guesthouse, so we headed back that way. 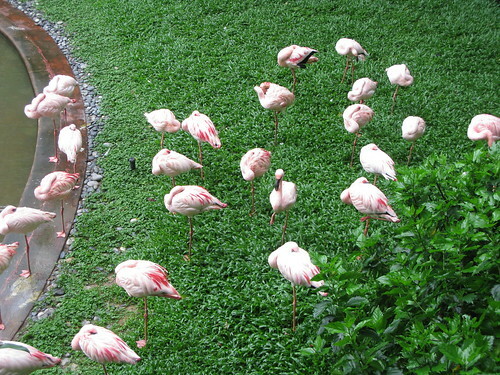 I decided I’d venture through Kowloon Park, so we parted ways and I had a walk through.Some sculptures and birds (including flamingos) to look at, so I ventured through then headed to the water. Lousy weather, so I headed back to the bookstore I’d been in a few days ago, and flipped through more graphic design books. In the evening, George and I set out to the Temple Street Market, determined to get some last minute shopping in. We both leave in the morning, so we’ve decided to try and stay up as late as possible, so we’re more on schedule for EST. We figure coffee might help, so we each get one, and spend a couple of hours playing table hockey, then head to the guesthouse with staying up on our mind. 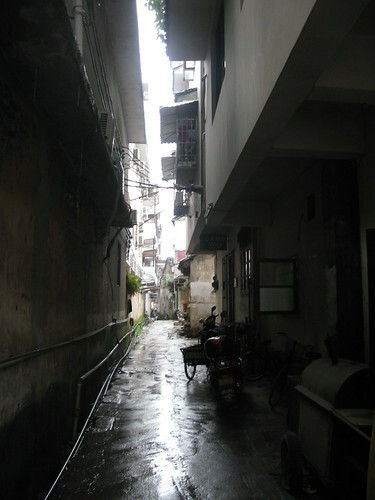 The rain followed me from Yangshuo, so I woke up to wet streets, and gray skies. George and I are in the same room, but on different sleep schedules, so we planned to meet at Pacific Coffee down the road, where there’s free internet and not-so-free coffee. After waiting for a while, I figure George is avoiding heading out in the rain (which is quite heavy now), so I head back to the guesthouse, and he’s just gotten out of the shower. We sort a few things, then head to the Art Gallery, which is close to the museum. We’re both a little underwhelmed – I was hoping for some more modern exhibits, but I think we’ll need to find some private galleries for that. 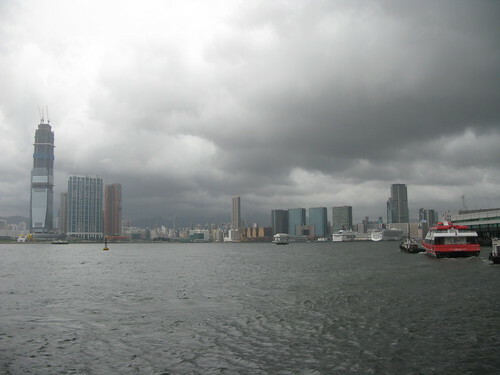 We head to Central, my second time on Hong Kong Island proper, but only the first time spending much time on the surface. We take the giant outdoor escalator up to Soho, and wander around – but I think we’re both a little underwhelmed once again. After Soho, we head to the pier to check out the water. Hard to see much in the fog, and hard to get an unobstructed view. They’re building a big bridge, which looks close to completion, as long as the two sides meet as planned. Next stop on the subway (I bought an Octopus card, which is a handy way of getting around) is Mong Kok. It’s supposed to be a bastion of electronics stores, but we don’t find anything too out of the ordinary. 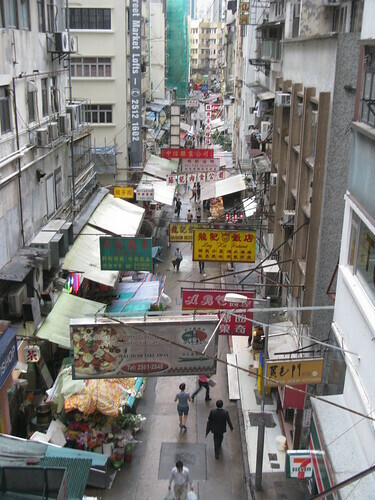 We make our way by foot back to the guesthouse, passing through Temple Street Market, which is just getting setup for the night. At the guesthouse I read for a bit, but am kinda sleepy, so I head up to the room and lie down. George has his laptop out, so I steal a bit of music from him. We head to a very busy (although maybe just because people want to escape the rain) noodle shop, and I have some pretty decent noodles. Just before we get the bill, the ceiling mounted air conditioner starts to leak, so there is really no escaping the rain. George wants fries and a Guinness, so we head to a pub, which seems to be where all the white people in Hong Kong hide out. I want to save a bit of money, so I just get a coke, but when the bill comes, I find it’s 34 Hong Kong dollars, which is about $5 Canadian. Yikes. I ask the bartender if there’s been some horrible horrible mistake, but he assures me there hasn’t been. I’m hoping to avoid going to the bank again before I leave Hong Kong, but it might prove difficult. Back at the guesthouse, the common room, which is a big veranda, essentially, and has part of the roof exposed, is starting to flood. Eventually the owner gets the idea in his head to clear the drain, and the situation improves, but it’s still too wet, and I’m falling asleep as I read, so I decide to head to the room and sleep. I get up early to see if I can have some laundry done while I’m spending the day in Macau. Lucky me, they offer the service, so I cart everything down – probably the last time these clothes will be washed in a while, as I’m not in a huge rush to be wearing the same clothes when I get back to Canada. It’ll be nice living out of a closet instead of a bag for a while, I think. Christine joins me in the common room soon enough, checks out, and we head to the ferry terminal to catch the ferry to Macau. Normally the trip takes 40 minutes or so, but for some reason (which is announced on the loudspeaker, but impossible to comprehend) the trip takes closer to an hour. Not a big deal. head to her guesthouse, and check her in. First stop after that is a bakery for a Portuguese custard tart. 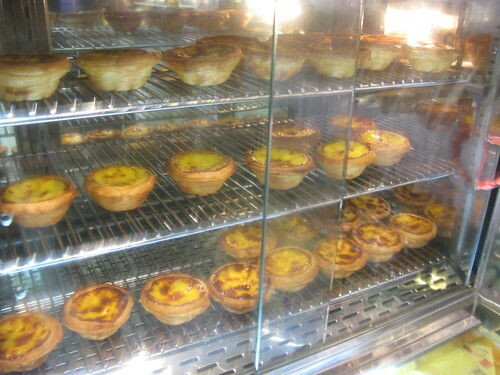 Macau is a former Portuguese colony, but the tarts are a little too eggy for my liking. I’ll have to get one in Canada. After our dessert, we get some lunch. The women running the small restaurant suggests we check out a church and a park, so we do. Not too special, though. We wander around for a bit, and reach The Ruins of St. Paul’s, which really are quite nice. 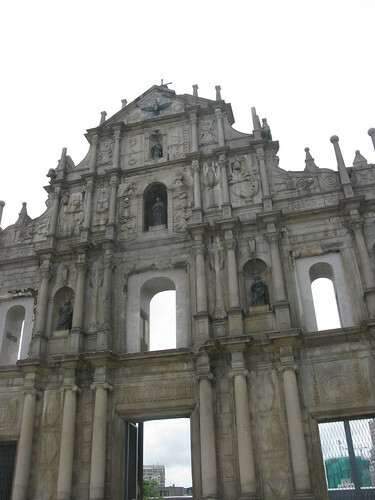 Macau is quite European in feel, and St. Paul’s is a nice departure from most of the ruins I’ve seen in Asia. 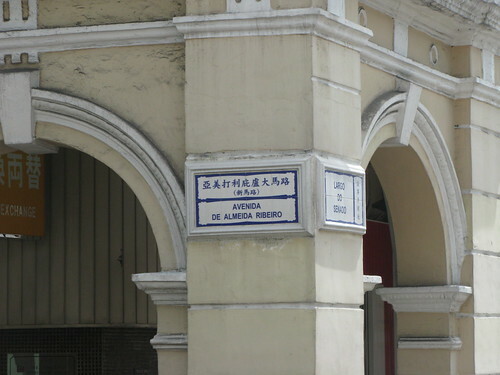 We check out the Macau museum, which isn’t all that special, then decide to hit the casinos. Macau is apparently bigger than Vegas now, but the casinos aren’t quite as nice. Casino Lisboa, Lisboa Grand are two of the older ones in Macau, although they’ve been redone since. We have some dim sum at the Wynn casino, which is fantastic fantastic (the dim sum, although the casino is nice too). I’m tempted to just spend another day in Macau so I can have some for lunch the next day. At the Venetian, we try to play roulette, but the minimum bet is too much for our liking. I find some street name fridge magnets in the casino gift shop, but can’t find one with DE ALMEIDA on it, but the women at the shop suggests I try the old town to see if they have it. We find our way there (eventually, and with much hilarity at the hospital), but all the gift shops are closed. Bummer. It’s getting late, so we head back to the Venetian. 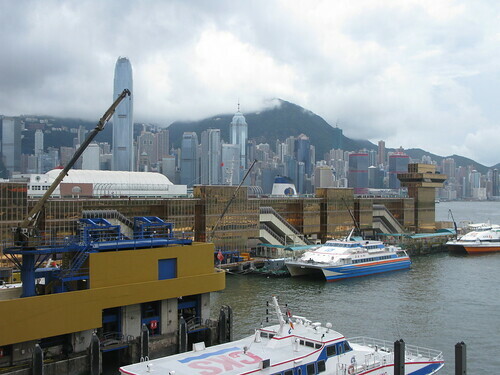 We’ve been spending the day using the casino shuttles as free transportation, so we shuttle back to the ferry terminal, and I catch the ferry back to Hong Kong. 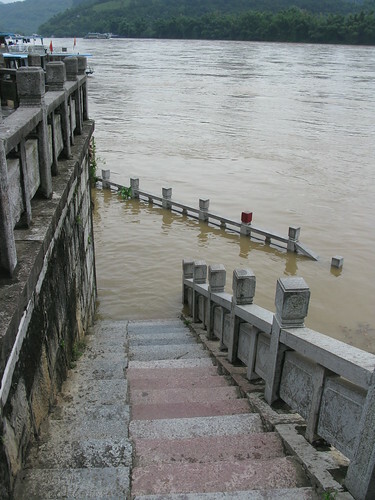 If I’ve planned it right, the MRT will still be open, and I’ll be able to get to the guesthouse. 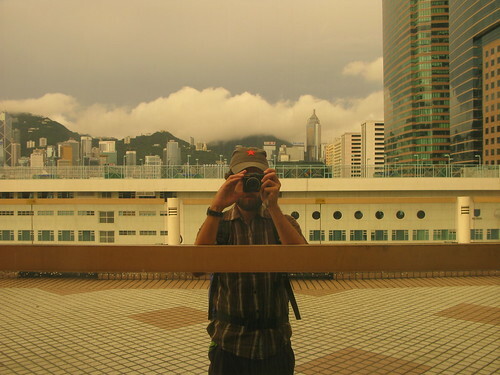 I know one person in Hong Kong, and it’s George (who has arrived from Yangshuo in the morning). Surprisingly not surprising, he’s who I see when I get on the subway back in Hong Kong. In a city of millions, the odds have to be low that we’d get on the same subway car at different stops at the same time, but here we are. We head back to the guesthouse together (he’s staying at the same place, in the same room,of course), chat in the common room with some others for a bit, then get some sleep. Night bus goes okay. A bit of a slowdown on a dirt road, where a big truck carrying spools of steel has flipped on its side. I’m dropped off at a bus station, in some unknown city, so I try and get a bus to Hong Kong. The women’s english isn’t very good, but she leads me down to the street, points to the left, and then bends her hand somewhat comically to signify another left. I’m not sure if I can just walk to Hong Kong, but I set off. Things don’t look great, so I pop into a hotel and she tells me I need to take a cab to the local station – so I do that. At the local station, it seems I can just walk to Hong Kong. So I do. Passing through immigration, of course. On the Hong Kong side, I head to 7-11 to buy a map. The clerk tells me the map has “some English”, and judging by the part I can see, it should be okay. Unfortunately once I buy it I discover that the map on the reverse, the one I need, is all in Chinese. I still manage to find where I need to go, so I hop on the MRT subway and head there. After a bit of searching I find the guesthouse. A bit of a dive, but it’ll do for four days. The lady at the counter tells me the price of the room, and that the prices will be going up July 1st. My first thought is “Great, it’s one of those places.”, meaning that it’s a place that people live, not just visit. It’ll make me enjoy home more, I think. After I check in, I wander around the city. 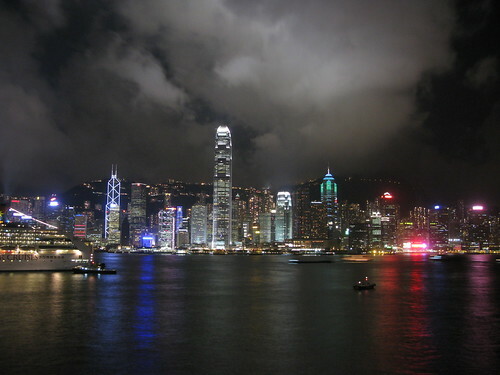 Not really in love with Hong Kong yet – it’s a huge city, with mostly shopping and the occasional restaurant. I found a nice grocery store, with a bunch of interesting Japanese things, and a nice bookstore with lots of interesting graphic design books, though. At night I head to the Temple Street Market for a look-see. A little pricey, but I may head back and buy something, eventually. 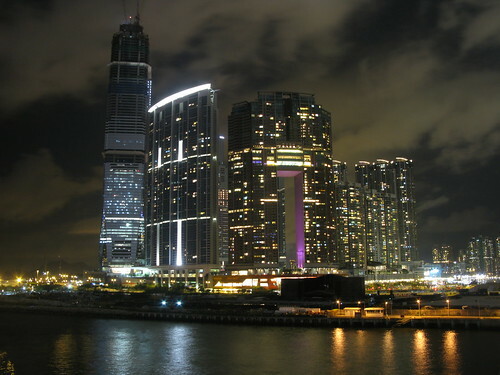 I head to Harbour City next, to get some night photos of the Hong Kong Island skyline. They turn out alright, but a tripod would make things easier. Back at the hostel, I talk to two Canadians who’ve been living abroad for years. There’s also a guy from the Philippines who has been living in Shenzen. We’re joined by a German girl, Christine, who is also heading to Macau in the morning, so we make plans to meet up in the morning and head there together. How High’s The Water, Momma? Wake up to the familiar sound of rain. 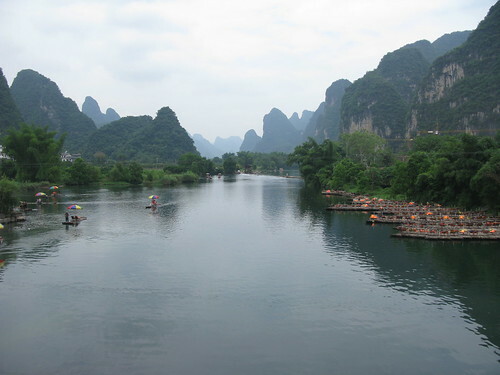 It’s my last day in Yangshuo, so I head out and grab some breakfast, and upload some pictures. Wonder of wonders, at about 11am, it stops raining. I stare at the cafe owners in disbelief, but it appears to be true. I still have to check out, so I head back to the guesthouse, checkout, and confirm my bus for the evening. As it turns out my bus is leaving at 6:40pm, instead of 8, so my hours are limited. I head over and talk to Christine for a bit, but she gets busy with a customer, so I wander off – running unexpectedly into the Irish lads from Dali, Alan and Wolfey, and their new companion Wade. 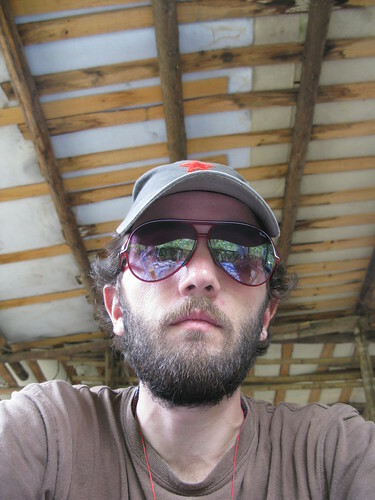 Aidan is still in Yunnan province, but is apparently on his way. They manage to book some rock climbing, and we do a bit more wandering. Before long it’s time for me to head back to the guesthouse, so I do – and have a bit of a struggle to get my key deposit back, but finally manage. This has definitely not been my nicest guesthouse experience, but at least I still have my bag and contents at the end of it all. I hop on the sleeper bus at nearly 7pm, and settle in for the long haul. More rain this morning. I head to the Minority Cafe, and hop on the internet. Get some coffee, and eventually some breakfast, and upload some photos. 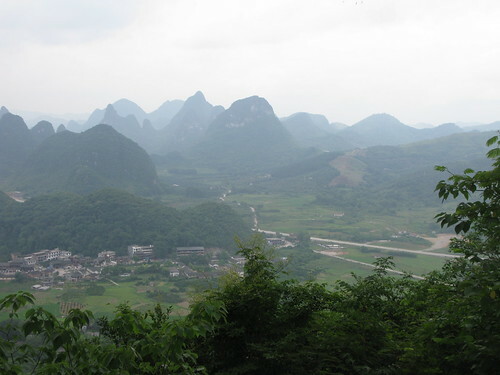 It’s much quieter today then the weekend, despite today being a holiday in China. I assume most people are heading home. That, or they’re afraid of the rain, or still sleeping. Probably those last two. Walking back to the guesthouse, I run into the girl who sold me the sunglasses, and chat with her for a while. Her western name is Christine, although it’s also Rosa. She tells me her Chinese name, but I forget it. She gets some customers, so I bid her adieu, and regroup at the hostel. Hop on the internet there, and the mother of the owner tries to get me to pay (internet is only free between 19:00 and 24:00, but never seems to be working at this time), but I refuse. She doesn’t speak english, so I just feign ignorance until she goes away. Back in town, I have some lunch, and do some reading, then get back to the hostel, and Natasha invites me to dinner with our new roommate, George (who I actually met in The Minority Cafe earlier), and two others – Danielle and Tom. We all order a dish, and share. They’re a bit small, so when we get to the next bar, I order some fries to fill me up. Not as good as the ones I had at Tiger Leaping Gorge, but they’ll do. We head back to the hostel, and I read a tiny bit, but I’m nodding off, so I just get some sleep instead. It’s hard work doing nothing all day. We get a snack at the bakery again, but eat it en route to Lucy’s cafe, where we get a real breakfast. I’ve got a craving for porridge – and it tastes okay, but would be better with brown sugar. After breakfast we take a short walk, and up getting caught in the rain. 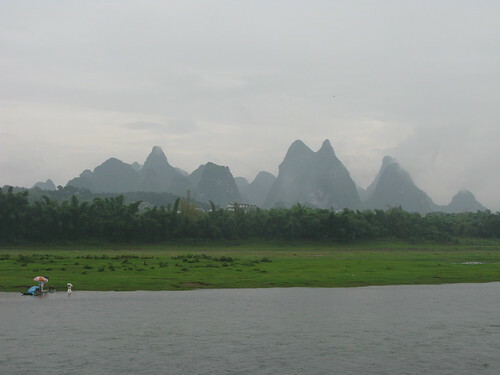 Seems like we’re in for a lot of rain here in Yangshuo. Rainy season, perhaps? 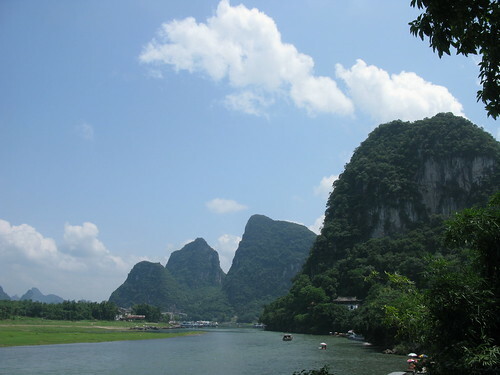 I didn’t have much planned for Yangshuo, but was hoping to do some rock climbing, so hopefully the weather improves. 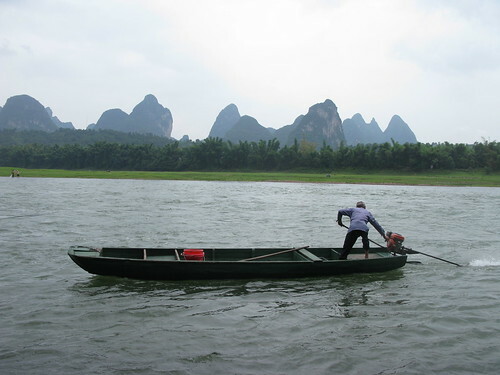 It’s also the Dragon Boat festival in China, the first time in 60 odd years that everyone gets the holiday. I figured there would be some racing along the river, but apparently not. Bit of a shame. The streets are relatively quiet, as most people seem to be staying inside and avoiding the rain. Smart. 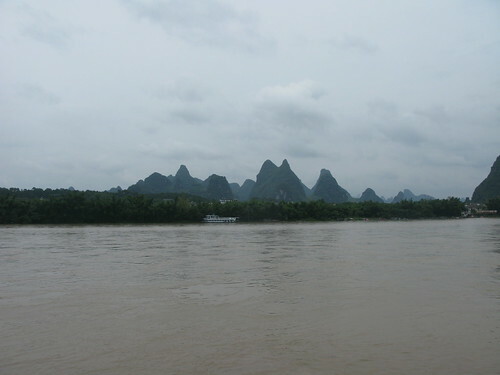 Natalia was going to stick around town for a bit, then head to Guilin, but since the weather is lousy and there’s not a ton to do here, she decides to head to Guilin early. 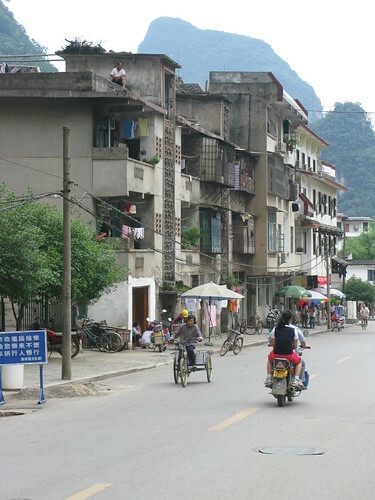 We head back to the guesthouse and check out – with me moving into a dormitory up stairs. I walk Natalia to the bus station in the rain (for some reason I didn’t bother to grab my raincoat at the guesthouse, so we share her umbrella) then head to the Minority Cafe to update this journal, avoid the rain, and drink some hot chocolate (followed by a coffee). My mom tells me Wayne is on facebook, so I send him an SMS via the Rogers website, and tell him to hop onto MSN. Chat with him for a bit, then decide to pay and head out before I wear my welcome out at the cafe. I’ll likely come back tomorrow, after all. Wander through some shops, but nothing really impresses me (and in typical Asian fashion, everyone sells the same unimpressive stuff). I spend the rest of the day reading in cafes, or wandering through the rain. I get some information on rock climbing, but it still looks like it’ll rain tomorrow. I head back to the guesthouse in the evening and chat with my dorm roommates for a bit. Mike from NYC and Natasha from England, plus a Scottish guy, whose name I never get. We grab some breakfast at the bakery near the guesthouse, then head to Minnie Mao’s cafe to get something to wash it down. Natalia is nearly finished her book, and has a 20 hour train ride ahead of her, so she needs another one. She asks me to suggest something, so I tell her to grab “The Road” by Cormac McCarthy. Hopefully she likes it. It did win a Pulitzer, so if she hates it she can’t say I am alone in my appreciation of it. 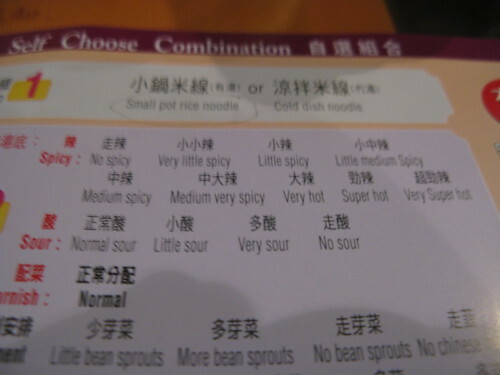 We have no real plans, other than to swing by and get our zongzhe. She’s remembered it, and we each get one. I had bought her a chocolate muffin at the bakery, so we do a swap. It’s sort of a sticky rice, rice pudding mixture. Not too bad, but not outstanding. I’m the only one of the three that likes it even a little. We do a bit of shopping, as Natalia needs to get a few things, and I should start considering picking up some items too. Untethered by any plans, we decide to take a stroll along the river, and end up coming across another market, this one a long stretch of vendors. They seem to be attracting the “just finished the river cruise” crowd, which unfortunately comes at us from the opposite direction. They’re armed with umbrellas to protect from the sun, so I worry I’ll lose an eye. We make it unscathed, and eventually reach an area that is untouched by tourists (other than the two of us). There’s a sign for a martial arts studio ahead, and a river retreat, so we head towards the retreat, hoping to grab a drink or something. 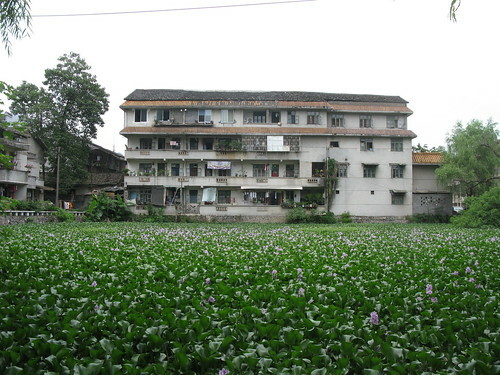 The retreat, is an expensive (for China) hotel, and we go in search of a restaurant, but there is no one around. It looks like a nice place, but not anywhere I’d stay on this trip. We head to the martial arts studio next, but it is likewise deserted. Chagrinned, we head back to the guesthouse, and grab a drink and read in a restaurant. We head back to the guesthouse, and I have a shower. Natalia mostly reads, while I watch a documentary on Go. I decide I should venture out for a bit, but it appears to be raining. I’m restless so I venture out regardless, landing at the Canadian run cafe. He’s got no power, so I can’t stick around, but I’m able to swap a couple of books for a new one. Do a bit of reading then decide to get some sleep. The plan is to rent some bikes, so when Natalia finally wakes up (complaining slightly that I didn’t bother to wake her up), we head down and grab some breakfast. We swing by the sunglasses place, but she’s forgotten to bring us the zhongzhe. Tomorrow, she assures us. We get some bikes from the Backstreets guesthouse. They seem pretty decent, although the saddles are never great on these bikes. We follow the map to a bike trail that runs near, but not along side the river. 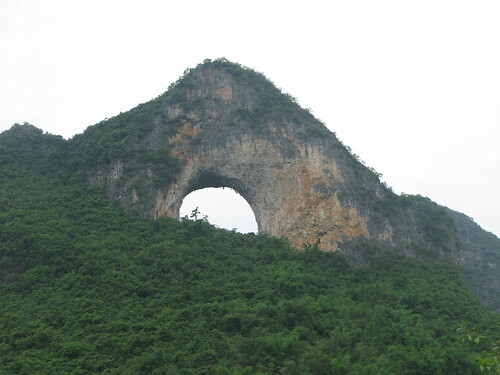 Natalia isn’t sure, but I win her over with my confidence that we’re heading towards Moon Hill, which is a karst formation with a moon shaped hole in it. Who wouldn’t want to see that? After a scenic bike ride, we arrive at moon hill, fend off the women trying to sell us water (“You’re too polite.” Natalia tells me. ), and make our way up the hill. A bit of a hike, but nothing compared to the Krabi climb a couple of months prior. We take some pictures up there, fending off even more water sellers, then descend, taking a different path so we can see the hill from a distance. We grab a drink and a light lunch from the cafe, before venturing out. We plan on going for an extra long ride, but the rain starts, so we figure we’ll head back. About 20 minutes from town, it really starts to pour, so we duck into a restaurant and decide to eat a second lunch. Noodle soup. Simple. It’s still raining, but a little less hard, so we make our way back into town, drop off the bikes, and have a shower at the guesthouse. For dinner we get some yak cheese pizza at a place run by an Ottawa native. He’s got a bunch of good books, so I’ll probably be back to grab at least one before I leave. The weather is still lousy, so we get some sleep. © 2019 TRAVELOG - All rights reserved.